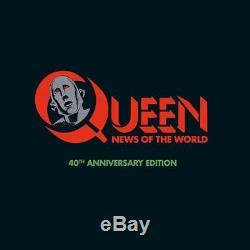 Queen - News Of The World (Preorder 17th November) (NEW 3CD, DVD, 12 LP BOXSET). Format: 3CD, DVD, 12 LP Box. Pre-orders will be despatched to arrive on or just after the UK release date. Orders will be charged upon checkout. Please note that on rare occasions release dates are subject to change by the record companies. A special box set of Queen's landmark 1977 album News of the World, marking the 40th anniversary of the original release. It opens with two of the band's most indestructible worldwide hits, the Brian May-penned We Will Rock You and Freddie Mercury's We Are The Champions, monumental stadium anthems which remain a staple of major sporting events all around the world to this day. The new package includes the original album on CD, plus two further CDs of recently unearthed out-takes and rarities from the band's archives, one of which is a newly created alternative version of the whole album Raw Sessions. For many Queen devotees, this Raw Sessions CD will be the most intriguing component of the new release. Mined deep from long-vaulted studio multi-track tapes, this extraordinary parallel album brings to light never-before-heard alternative versions of each of the albums 11 tracks. The package is completed with a brand new one-hour DVD documentary, Queen : The American Dream, created from backstage material filmed during Queens 1977 USA News of the World tour. VINYL LP: The Original News of the World Album new Pure Analogue Cut Side A 1. We Will Rock You (May) 2:01 2. We Are The Champions (Mercury) 2:59 3. Sheer Heart Attack (Taylor) 3:26 4. All Dead, All Dead (May) 3:10 5. Spread Your Wings (Deacon) 4:34 6. Fight From The Inside (Taylor) 3:03 Side B 1. Get Down, Make Love (Mercury) 3:51 2. Sleeping On The Sidewalk (May) 3:06 3. Who Needs You (Deacon) 3:05 4. It's Late (May) 6.26 5. My Melancholy Blues (Mercury) 3:29 CD1: The Original Album (Bob Ludwig 2011 master) 1. Fight From The Inside (Taylor) 3:03 7. Get Down, Make Love (Mercury) 3:51 8. Sleeping On The Sidewalk (May) 3:06 9. Who Needs You (Deacon) 3:05 10. It's Late (May) 6.26 11. My Melancholy Blues (Mercury) 3:29 CD2: NEWS OF THE WORLD : RAW SESSIONS 1. We Will Rock You (Alternative Version) 2:29 2. We Are The Champions (Alternative Version) 4:33 3. Sheer Heart Attack (Original Rough Mix) 4:17 4. All Dead, All Dead (Original Rough Mix) 3:08 5. Spread Your Wings (Alternative Take) 4:56 6. Fight From The Inside (Demo Vocal Version) 3:08 7. Get Down, Make Love (Early Take) 4:02 8. Sleeping On The Sidewalk (Live in the USA, 1977) 3:49 9. Who Needs You (Acoustic Take) 2:46 10. It's Late (Alternative Version) 6:44 11. My Melancholy Blues (Original Rough Mix) 3:36 CD3: NEWS OF THE WORLD : BONUS TRACKS 1. Feelings Feelings (Take 10, July 1977) 1:55 2. We Will Rock You (BBC Session) 1:36 3. We Will Rock You (Fast) (BBC Session) 2:52 4. Spread Your Wings (BBC Session) 5:33 5. It's Late (BBC Session) 6:39 6. My Melancholy Blues (BBC Session) 3:13 7. We Will Rock You (Backing Track) 2:03 8. We Are The Champions (Backing Track) 2:59 9. Spread Your Wings (Instrumental) 4:23 10. Fight From The Inside (Instrumental) 3:02 11. Get Down, Make Love (Instrumental) 3:49 12. It's Late (USA Radio Edit 1978) 3:52 13. Sheer Heart Attack (Live in Paris 1979) 3:35 14. We Will Rock You (Live in Tokyo 1982) 2:55 15. My Melancholy Blues (Live in Houston 1977) 3:48 16. Get Down, Make Love (Live in Montreal 1981) 4:35 17. Spread Your Wings (Live in Europe 1979) 5:20 18. We Will Rock You (Live at the MK Bowl 1982) 2:08 19. We Are The Champions (Live at the MK Bowl 1982) 3:32 DVD: QUEEN : THE AMERICAN DREAM. SEALED/UNSEALED Please note all of our stock is brand new and sourced directly from UK record companies and will be delivered to you exactly as supplied to us. It is very common for UK record companies to supply CDs and DVDs that are not sealed or shrink wrapped. And as such we strive to offer a 5 star service at all times. If you live in the U. The item "Queen News Of The World (Preorder 17th November) (NEW 3CD, DVD, 12 LP BOXSET)" is in sale since Friday, November 03, 2017. This item is in the category "Music\CDs". The seller is "badlandsuk" and is located in Cheltenham, GLOS. This item can be shipped worldwide.